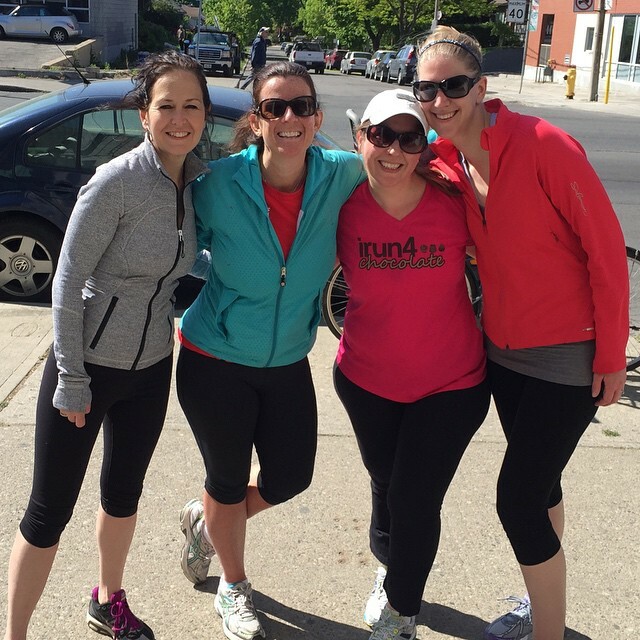 A Splendid Messy Life: Spring into Fitness! Do you have a wellness routine? How do you set fitness goals and stay motivated? These are questions I've been asking myself over the past 5 months or so. For me, I need an event to work towards. I'm not good at working out for the sake of exercise. I need a specific goal. In the past I've worked towards a couple of 5k runs. What's fun about a 5k run is that there are so many different kinds now to try! I've registered for the Island Girl run on Toronto Islands this fall. And I've always wanted to try a Color Me Rad run so that's also on my exercise bucket list. A few weeks ago, my friend even did a Chocolate Run which is exactly what it sounds like. There were chocolate strawberries to snack on after 1k, and then more chocolate goodies (including a chocolate martini) at the end of the 5k. That's my kind of motivation. If you've been following me for a little bit, you probably know that I'm currently training for Mudderella. I'm not an exercise buff by any means, but it has felt good to get back into a bit of a workout routine. There are so many Couch to 5k or 10k apps that help you slowly build your strength, and I really like the app Map My Run to track where I've been when I'm running outside, along with the time of my intervals. Last week I did the biggest run I've ever done before. 7km! I ran in 10 minutes intervals, so I ran 10 mins and then walked 1 min. It was a perfect running morning, and it was so fun to run with some of my Mudderella teammates. Plus for the next few days I felt that amazing sore-workout feeling that reminded me I'm challenging myself and moving forward. Trust me, I'm the first to admit it can be daunting to think about working out or going for a run. Especially when Netflix and wine are calling your name. If my friend hadn't asked me to train for Mudderella, I'd probably not have added exercise back into my routine this year. I'm so grateful she did because running again really makes me feel so much healthier and happier. Bankers Heathcare Group has created this infographic below that I really wanted to share along with my thoughts about fitness to celebrate May as National Physical Fitness and Sport Month. Bankers Healthcare Group provides financing for healthcare professionals, such as physical therapists. They also do some very cool projects such as the Send a Smile Campaign. They created this graphic because they feel it is crucial to stay connected with the health, fitness, and wellness communities since they work so closely with those who also keep us healthy. You can read it out now, or just pin it for later. Whether you're interested in yoga, Zumba, running, strength training, or just eating a bit healthier, I hope you join me by checking it out and picking up some new tips to add to your fitness/wellness routine this summer!